Historically, nationalists in Ireland have looked to their cousins in the United States for both financial assistance and diplomatic support. This support has never been a foregone conclusion, but at critical moments in Irish history, usually during times of political tension, Irish-America has taken a keen interest in Irish events. During the turmoil of the Land War, with its news of evictions and the threat of renewed famine, Irish-American organisations such as the Irish National League of America garnered much support for Parnell’s political campaigns in Ireland. Subsequently, the United Irish League (UIL) also provided valuable financial support for John Redmond’s Irish Parliamentary Party, especially as prospects for Irish Home Rule brightened in the years before the First World War. The Friends of Irish Freedom (FOIF) was founded a few weeks prior to the 1916 Rising ostensibly to promote the cause of Ireland in the United States. In their first constitution, they pledged themselves ‘to encourage and assist any movement that will tend to bring about the national independence of Ireland’. Yet, as we shall see, there were also American factors behind their foundation. The evolving character of the Irish immigrant group as well as the American political environment heavily influenced the history of the movement, often giving rise to misunderstandings of a fundamental nature on both sides of the Atlantic. It was another Irish-American organisation, the Clan na Gael, that played a key role in the foundation and direction of the Friends. Of the seventeen-man FOIF executive, fifteen were Clan members. Founded in 1867, the Clan was a secret revolutionary society dedicated to the cause of an Irish republic. It was involved in all kinds of activities, ranging from the rescue of Fenian prisoners in Australia to commissioning Irish engineer and ex-Christian Brother John P. Holland to build a submarine to take on the British navy. It also had well-established contacts with its counterpart in Ireland, the Irish Republican Brotherhood (IRB). The Clan’s role in the 1916 Rising has been well documented. Its leader, John Devoy, knew of the impending rising and no doubt wanted to have a propaganda organisation in place in America to exploit the expected news from Ireland. The FOIF was founded at the First Irish Race Convention on 4 March 1916, at New York’s Hotel Astor. The convention attracted 2,300 delegates, many of high social standing. As Devoy later proudly pointed out in his memoirs: ‘At no previous Irish convention was there even one [state] supreme court judge; there were five at this, besides several other judges of lesser rank, and a large number of lawyers’. Judge Daniel Cohalan, who helped Devoy to reunite the Clan in 1900 after the factionalism of the previous decade, became the acknowledged leader of the Friends. Cohalan, whose parents came from Ireland, typified the great social strides many Irish-Americans had made by the early twentieth century. Elected to New York’s supreme court in 1911, his voluminous papers reveal a man who exercised considerable influence in American politics, especially with members of the Republican Party and with the Irish-dominated Catholic hierarchy. As with other Irish-American organisations, both before and since, events in Ireland helped to publicise the FOIF among Irish-Americans. Irish-American opinion was outraged by the executions that followed the 1916 Rising, and the Friends capitalised on this to the utmost. The organisation did not achieve its full numerical strength until after the First World War, however. During the Anglo-Irish war, as lurid news of the Black and Tans’ atrocities reached Irish-America, membership soared. By the summer of 1920 the organisation numbered 100,000 regular members and an additional 175,000 associate members. It opened the Irish National Bureau in Washington, which distributed a Newsletter and countless pamphlets and leaflets to thousands of prominent Americans and opinion-formers. The Friends also sought to use their numbers to put the Irish case for self-determination before the US Congress and president, though with mixed success. One might have expected a close working relationship between the Friends and what became the main nationalist party in Ireland, Sinn Féin. Éamon de Valera believed that the Friends could be used to secure ‘the great lever of American opinion’ in support of Irish objectives in Ireland. Relations between the movements were dogged by tension and conflict, however. The Friends resented the dictation of Sinn Féin representatives in the United States and believed that the direction of the organisation should be in American hands. Matters came to such a head that Bishop Michael Gallagher, the president of the Friends, denounced de Valera as a ‘foreign potentate’. Finally, in October 1920, in an atmosphere of mutual recrimination, Sinn Féin publicly severed its ties with the FOIF. While personality differences between Cohalan and de Valera certainly contributed to this conflict, there was a deeper ideological conflict between the Irish-American nationalism represented by the Friends and the Irish nationalism of Sinn Féin. At this point the Catholic Irish in America had improved their social position compared to their degraded status during the Famine period. Yet despite these advances, Irish-Americans still felt discriminated against by what Devoy referred to as a pro-British Anglo-Saxon élite. It was felt that this élite not only denied Irish-Americans their rightful place in American society but also identified as much with the interests of Britain as they did with the United States. In response, Irish-Americans founded societies such as the American Irish Historical Society (1896), which emphasised their loyalty to the American nation. 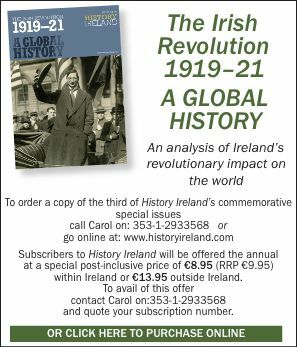 The Irish contribution to American colonial history and the heroic Irish contribution to America’s wars became a characteristic feature of the society’s publications. Cohalan joined the society in 1898 and served as a member of its executive council for nearly 40 years. Irish ethnic opposition to the perceived pro-British element in the United States also took on a political dimension and increasingly influenced the activities of the Clan in the decades before the First World War. Devoy and Cohalan feared that any close cooperation between Britain and the United States would increase the power of the Anglo élite in American society. This cooperation would be detrimental not only to the interests of Irish-America but also to America itself. In 1897, following calls for a comprehensive arbitration treaty that would settle all outstanding disputes between the United States and Britain, Devoy’s wing of the Clan despatched resolutions to the president and both houses of Congress protesting against its ratification. In the event, the Senate failed to ratify the treaty (for reasons other than Irish-American pressure). Yet the vociferous opposition of Devoy to this measure indicates the Clan’s increasing identification of the interests of Irish-America with those of the United States. The founding of the Gaelic American in 1903 offers further evidence for this increasing American orientation to the Clan’s activities. The newspaper was edited by Devoy, with Cohalan as president of its board of directors. In its first edition (19 September 1903) the paper referred to Irish-Americans as ‘the sturdiest champions of American principles’, but argued that ‘these principles were assailed at the very fountain head by an organised movement to destroy the old American spirit and substitute for it a servile dependence on England’. The editorial warned that ‘a clique of pro-British sycophants’ were seeking to gain control over the direction of American foreign policy. Prior to 1914, the chances of establishing an organisation dedicated to combating British influence in America seemed remote. Irish revolutionary nationalism was at a low ebb on both sides of the Atlantic, while the apparent success of Redmond’s Parliamentary Party disappointed and frustrated the Clan leadership. Events in Ireland played into the hands of the Clan, however. Redmond’s declaration of support for the British war effort in 1914 alienated much of Irish-American opinion, and his popularity among Irish-Americans declined far more rapidly than it did in Ireland. The Irish World (15 August 1915), an Irish-American newspaper that had previously supported Redmond, now argued that for Redmond to ‘fritter away any part of her [Ireland’s] military resources by going to England’s defence would be treason of the blackest kind’. Meanwhile, the UIL, Redmond’s support organisation in the United States, went into rapid decline. In 1916 the Clan went ahead with their convention, which provided the launch pad for the FOIF, now representative of a largely united Irish-America. While speeches denouncing Redmond and advocating Irish independence were a major focus of the convention’s deliberations, it is also clear from its ‘declaration of principles’ that the task of countering pro-British influence in the United States and ensuring continued American neutrality was a major aim of the new organisation. The declaration insisted that the United States should not enter the war as England’s ally. In a pointed reference to the sinking of the Lusitania, mention was made of Britain’s current attempts to ‘shield her floating arsenals and munitions transports behind the skirts of American women and children’. The Gaelic American (11 March 1916) also declared after the convention that ‘the pro-British movement is now confronted by an organised Irish race throughout the land’. The outbreak of the Easter Rising in Dublin, a mere six weeks after the Race Convention in New York, presented the Friends with a golden opportunity to bring their message home to thousands of their fellow Americans. Mass meetings were held in areas of Irish-American settlement, condemning British atrocities in Ireland and calling for the continuation of American neutrality. The Friends also organised speaking tours for ‘exiles’ from Ireland such as Hanna Sheehy-Skeffington, Nora Connolly and Liam Mellows. Nevertheless, while the FOIF was able to organise mass meetings of several thousand people, membership did not grow as one might have expected. Because of government fears that the war in Europe could provoke conflict among the different national groupings in the United States, ‘Americanisation drives’ were directed at those foreign-born Americans who displayed any overt identification with their country of origin. Such people were branded in the press as ‘hyphen Americans’. Once the United States entered the war in April 1917, suspicion of un-Americanism and ‘hyphenism’ intensified. Britain was now America’s ally, and attacks on British policy in Ireland could be viewed as disloyalty to the United States. As a result of this oppressive wartime atmosphere, FOIF activities were drastically scaled back and many branches ceased to function for the duration of the war. By the end of 1917 membership had fallen to just over a thousand members. FOIF membership card, signed by secretary Diarmuid Lynch, for 1921. Membership by then was already in steep decline (see right). Such Irish-American reticence can also be explained by reference to traditional Irish-American support for the United States in time of war. On the eve of American entry into the war, the Clan issued a circular that read: ‘We will remain loyal and will yield to none in the devotion to the flag, whether the United States goes to war or remains at peace’. The mainly Irish-American 69th regiment under ‘Wild Bill’ Donovan was one of the first American units to go to the European front, and indeed featured in FOIF publicity material for an ‘Irish Victory Fund’ after the war. The Friends wanted to link Irish national demands to President Wilson’s peace plan for national self-determination for the oppressed peoples of Europe. Sinn Féin representatives believed, however, that such calls could be construed in Ireland as something less than the Irish Republic that the men of 1916 had died for. In June 1920 Cohalan, drawing on his influential political contacts, had persuaded the Republican Party at its Chicago convention to include Irish self-determination in their election platform. Much to the consternation of the Friends, however, de Valera’s insistence on a resolution calling for the recognition of the Irish Republic led to the abandonment of Cohalan’s proposal. In a pointed reference to de Valera’s appearance at the Chicago convention, complete with marching bands and torchlight parades, the FOIF Newsletter (19 June 1920) condemned the ‘brass band’ dictatorial methods of those who refused to be guided, advised or led by ‘American brains’. The Friends welcomed the triumph of the pro-Treaty side in the Irish Civil War. In 1923 Cohalan, accompanied by Diarmuid Lynch, national secretary of the FOIF, visited Ireland and was warmly welcomed by Free State leaders. John Devoy was also awarded an official welcome on his visit to Ireland in 1924. The Friends were still incensed, however, at the Free State’s application for League of Nations membership. In May 1923, the FOIF reprinted and distributed an article from the Gaelic American (28 April 1923) entitled ‘The Free State makes bad blunder in applying for League membership’. The article claimed that Ireland would achieve nothing by being in the League and would only serve as ‘bait’ to draw the United States in. The Friends went on to argue that such a move would ‘deprive it of the sympathy and support of millions of Americans of Irish blood’. The credibility of the Friends as the voice of Irish-America would soon be open to question, however. The ending of the Anglo-Irish War and Irish-American horror at the civil war that followed had a devastating impact on the movement, as it did on other Irish-American organisations. As Irish-Americans lost interest in Ireland, support dwindled. By 1928 membership had fallen to only 654. In 1935 the FOIF was finally wound up, and its records were transferred to the American Irish Historical Society. The development of the FOIF illustrates the impact of the changing character of the Irish immigrant group in America and the American political situation on Irish-American nationalism. Irish-Americans took pride in their American identity and their contribution to the American nation, and this sense of American identity also coloured the Irish-American nationalism of the FOIF. Given the increasing tensions between Sinn Féin and the FOIF, especially over the dispersal of the Victory Fund, a public rupture between both bodies was inevitable. Predictably, when this open breach did take place in November 1920, each side blamed the other for the split. Yet in reality neither side was to blame. The nationalist ideology of each movement was shaped by the social and political milieu in which it operated. Each felt fully justified in its actions and neither side quite understood the other. Michael Doorley is an Associate Lecturer in History and Politics in the Open University in Ireland and in the American College, Dublin. F. M. Carroll, American opinion and the Irish question (Dublin, 1978). M. Doorley, Irish-American diaspora nationalism: The Friends of Irish Freedom, 1916–1935 (Dublin, 2005). K. Kenny, The American Irish: a history (Harlow, 2000). T.J. Meagher, Inventing Irish America (Notre Dame, 2001).